How To Remove A Bird In The Attic - Birds can be a big problem for those who have to deal with them in any part of the home, but while they are most commonly found nesting on the roof or in a chimney stack, if they are getting in and out of the attic there are a different set of challenges to deal with. 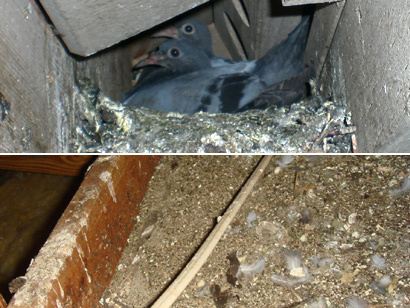 Because of their ability to breed throughout the year, many pest bird species such as pigeons can be nesting with her young at any time of year, which can make them particularly challenging to deal with. These birds can cause a significant amount of damage, but the first step you will need to take is to check the species of the bird and the time of the year, as it can be illegal to interfere with certain protected bird species during their nesting season. There are a number of reasons that mean you should look to deal with this kind of problem as soon as possible, but one of the first ones is the damage that the birds will cause once they have found their way into the attic. They will tear at insulation material and any other loose material that can be used to create a nest, while they can also contaminate the attic area. Pest birds also bring with them the potential of disease, both in terms of the bacteria and spores to be found in their droppings, and in the diseases that they carry. Another problem that is also worth considering is that once a solitary or small number of birds find their way in, others could follow. One of the most important things to do if you are going to be dealing with birds is to do so safely, as they can transmit diseases, and when disturbed their feces can also be dangerous. Make sure that you wear thick long sleeved clothing to protect your arms and legs, and a pair of gloves in order to protect your hands too. It is also worth wearing a breathing mask and goggles in order to protect yourself from any possible diseases. Bear in mind that if you do disturb a female during her nesting period, they may react aggressively, so it is important to be cautious when going into the attic, and to pay attention to any signs of the bird being present, such as sounds and fresh feces on the floor of the attic. When it comes to dealing with the birds in the attic, one way is to catch the animal and then to remove it to a new location a distance away from their current home in your attic. Because birds can cover long distances and have a natural homing instinct, this can prove to be problematic as birds do have the ability to fly quite long distances. Another problem with using the live trapping approach is that the birds can become aggressive or even hurt themselves in the trap, so when you are moving them, it is often best to cover the trap in a blanket. Releasing the bird safely can also be challenging, as opening the door to the trap without getting pecked by the bird is another aspect that can also require protective gloves. There are a number of steps that can be taken once you find that the birds causing the problems are out of the attic, and the most important first step is to examine the entire area to find out if they have more than one entry point to the attic. Once you are confident the birds are outside the building, start to deal with those entry points by sealing each one with appropriate material to match the exterior of the building. This can be cement filler for a small hole in the masonry, or can include replacing any damaged vents in the area, while you may want to consider using a metal flashing to protect any vulnerable parts of the structure that is likely to be exploited again by birds. Once you have removed the birds and sealed the attic, it is important that you carry out any repairs and disinfect the attic so that it is once again safe for people to go into the attic. The biggest concern will be the cleaning of the droppings, and you will still need your protective equipment when dealing with this, and along with removing the droppings you may also need to replace any soiled insulation material and the nest itself. Once all of these have been removed and disposed of safely, fumigate the attic with a disinfectant solution to ensure that no bacteria or spores remain that could be harmful. Go back to the main Pigeon and Bird Removal page for more information about dangers and signs of bird in the attic.